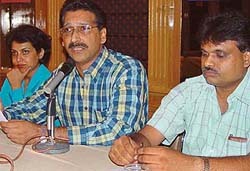 The city Mayor, Ms Lalit Joshi’s, approval to an official proposal of renting out ground space for running a giant wheel in Mani Majra and the criticism of her this move by the opposition BJP has sparked off a controversy as to whether the post is only ‘decorative’ or capable of meeting expectations of the people. An employee of the UT Electricity Department and another of the Punjab Irrigation Department were found dead in separate incidents under mysterious circumstances here today. 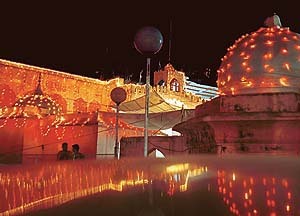 Mansa Devi Temple decked up on the eve of Navratra festival in Panchkula on Sunday. The police claims to have arrested Jagbir Singh, a briefcase snatcher, from the Inter-State Bus Terminus, Sector 17, here this evening. Police parties have been sent to nab his accomplice. Mutilated body of Mahavir Singh, a man of Burail village, was found on the Kalka-Ambala railway track near here early today. The police says that the body was first noticed by a passerby, who, then, informed the police. 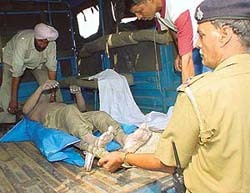 Mahavir had been crushed under a train late yesterday. The Sector 40 MIG Houses Welfare Association organised its annual function here yesterday, where tiny tots of the sector presented a cultural programme. A members’ directory of the association was also released on the occasion. Capt Amarinder Singh, Chief Minister of Punjab, today expressed deep sorrow and profound grief over the death of Mr H.S. Sodhi, a veteran journalist, after a prolonged illness. The move to increase the cost of land acquired for building co-operative societies in Sector 20 here by about 80 per cent has spread resentment among citizens. In spite of repeated demands, HUDA has been denying them basic amenities. Residents of Sector 48 A and B had to go without power for around 12 hours today due to a puncture in the cable in the sector. Cash and jewellery worth over Rs 50,000 were allegedly stolen from the Sector 9 house of Mr Jagdish Kumar Arora on the night October 3. The family was away when burglars broke into the house and decamped with gold and silver jewellery and Rs 30,000. A case under Sections 457 and 380, IPC, has been registered. Customers purchasing non-jewellery items worth Rs 500 and Rs 1500 worth of jewellery from Sector 22-D market from tomorrow may win a car, TV, fridge, washing machine, microwave, OTG, music system, VCD player, dinner set, luggage carriers and watches. D.A.V. Public School, Sector 8, a pioneer in introducing e-education in classrooms, made a humble start with just over 200 students from a site allotted by the Chandigarh Administration in 1979. SUPERVISION, organising, planning and monitoring activities in school are some of the activities which sum up Principal Sarita Manuja's day at school. Though she staunchly believes in delegating her powers to the staff for smooth functioning of the school, her endeavour has been to raise the already high standards of her school. AS a student of Class X, I am proud that I have the privilege of being a part of DAV Public School. It has all what it takes to be an ideal school. Ever since its inception, DAVPS has evolved into a leading center of education for the younger generation of the city. This is reflected in its performance in the recent past. With cholera being endemic to a number of third world countries like India, Bangladesh and Africa, efforts are on to develop an efficacious oral vaccine, as even today the disease is synonymous with under development. The local unit of the Bharatiya Janata Yuva Morcha today organised a blood donation camp in the memory of Pandit Deen Dayal Upadhyay, a founder member of the Bharatiya Jan Sangh. 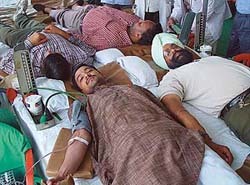 A total of 93 units of blood were donated by the activists of the morcha. Guru Nanak Mission Public School, Paonta Sahib, will meet Sanjay Public Senior Secondary School, Sector 44, in the tomorrow’s final of the CBSE North Zone CBSE Football Tournament played here today.